Ivaylo Alexiev - Ballet Arts Centre of Winchester, Inc.
Ivaylo Alexiev was born in Varna, Bulgaria. He started his ballet training with the Vaganova Method at the National Ballet School in Sofia. Mr. Alexiev than earned a scholarship from "UNESCO" to join the prestigious Academy of Ballet “Princess Grace” in Monte Carlo directed by Madame Marika Besobrasova. 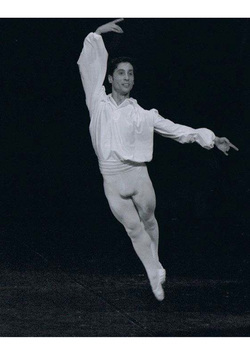 From 2001-2004 Ivaylo was a member of Le Ballet de L'Opera National de Bordeaux, France where he danced for three seasons. In 2004 Mr. Alexiev moved to Germany and worked with several contemporary companies. Ivaylo took part in many Dance Galas in Europe and has been invited as a guest artist in France, Germany, Russia, Malta, Japan, USA. He has worked with some of the biggest names in European ballet including Elisabeth Platel, Charles Jude, Irek Mukhamedov, Roland Vogel, Attilo Labis, Eva Evdokimova. Ivaylo speaks five languages and obtained a diploma in dance pedagogy and history of dance. In 2010 Mr. Alexiev moved to US joining Jose Mateo Ballet Theatre as a principal dancer. He has been a part time faculty member at Boston Ballet School since 2014, North Atlantic Dance Theatre company coach, and full time Ballet Master at Festival Ballet Providence since 2015.